The West Rim Trail (WRT) is a very scenic long-distance trail that mostly follows the western edge of Pine Creek Gorge, from Ansonia to near Blackwell. Parts of the WRT pass through mixed Allegheny hardwoods, featuring white ash, cherry, and hemlock. In other areas, the trail winds along ridges of oak forest with abundant mountain laurel, and it also passes through boggy meadows near beaver dams. You will encounter some challenging topography when the trail departs from the edge of the main gorge to traverse side canyons. Best of all, the sections of the WRT along the main gorge lead to many outstanding vistas, some well over 1,000 feet above Pine Creek. The WRT is currently connected to the northern end of the Mid State Trail; in the future, that section will become a blue-blazed connector between the WRT and the new northern extension of theMST on the other side of the gorge. Meanwhile, intrepid backpackers can reach the Black Forest Trail from the southern end of the WRT by following a section of the Pine Creek Rail-Trail downstream to Slate Run. 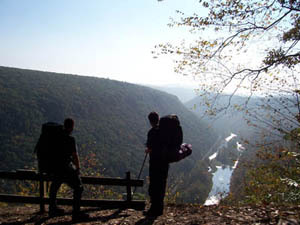 A backpacking trip on a portion of theWRT is also featured in 50 Hikes in Central Pennsylvania (2001), by Tom Thwaites. The WRT’s northern terminus is at a forestry maintenance building approximately 1 mile south of US 6 on Colton Road, outside of Ansonia. The southern terminus is along PA 414 at Rattlesnake Rock parking area, 2 miles south of Blackwell. The trail was initially laid out by a forestry student, and the Bureau of Forestry continues to maintain it. The main trail is orange-blazed, and several access trails that lead in from nearby roads are blue-blazed.